Much of the power in art lies in its ability to evoke a mood in its viewer. A successful painting sings like a favourite song, capturing a moment in time. 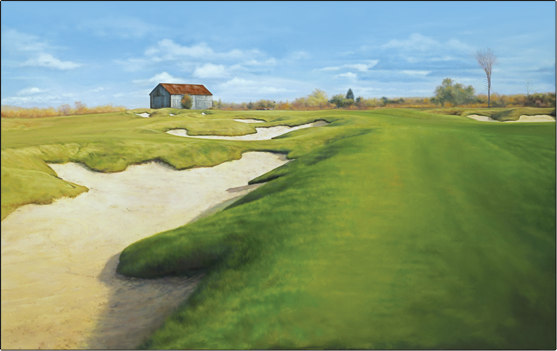 Michele Clarkson’s skills as a golf artist really shine in the softness in her contemporary realism style that brings its viewer into the serenity of the game. Her paintings bring back the feeling on the course where all is quiet except for perhaps a chirping bird, the sun is warm, shadows long, and stress seems so far, far away. Clarkson’s work seems less about the victory versus utter defeat, and all about the time on the course that smelled of sweet grass clippings and summer breeze. “I love taking a white canvas and I just start painting--sort of zone out--and after a while all the white is gone. I finish and I can feel the mood in the scene, like I was right there again. That’s when I know I’ve been successful,” says Clarkson from her Collingwood Ont., studio. Clarkson, 50, is a lifelong painter who turned professional in 1997. Born in Toronto, ironically she grew up in a town called Clarkson on Lake Ontario in Mississauga, Ont. In the mid-nineties, she moved up north to Penetanguishene, Ont., where she raised her two boys and worked as a graphic designer. With the encouragement of renowned Canadian artist Robert Bateman, she began painting full time with a focus on wildlife and nature. Her work has been seen at the McMichael Canadian Art Collection, National Capital Fine Arts Festival, Archives of Ontario, Buckhorn Fine Art Festival and the Algonquin Art Centre. She has also been able to work with Ducks Unlimited and Wildlife Habitat Canada with Environment Canada. Two years ago she started golfing, and says she fell in love with the golf landscape. 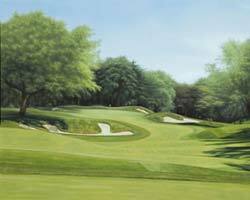 Although a relative newcomer to golf art, Clarkson has quickly proved her aptitude at recreating the calm on the course to the calm on the canvas.